Imogen's Typewriter. : Under my Christmas Tree! Another Christmas has been and gone! 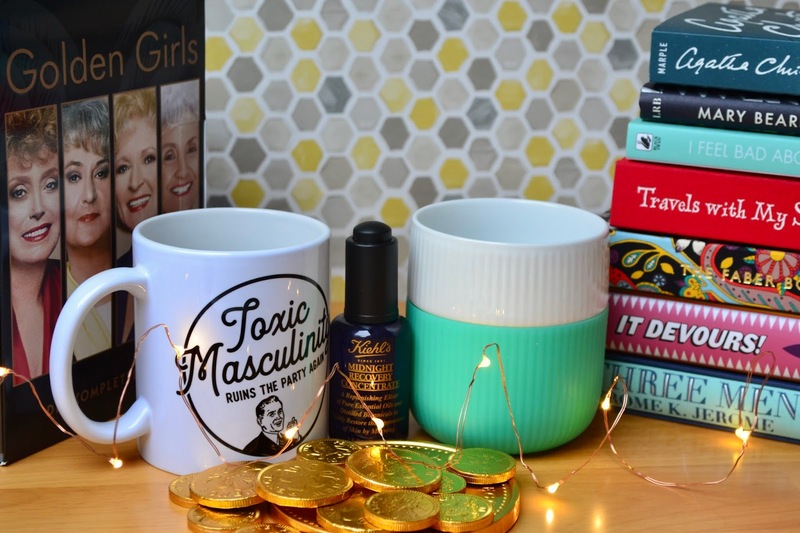 I really like seeing what people got for Christmas, mainly because I'm nosey, and I like writing this post every year. It's my way of looking at everything together and feeling ever so lucky. And I get to look back at what I got last year, the year before that, the year before that and the year before that. It's wild to see how tastes change and stay the same year after year. Plus, I'll bet there are other people like me that just love reading these types of posts. Welcome! Anyone who knows me, knows I do love a good mug. 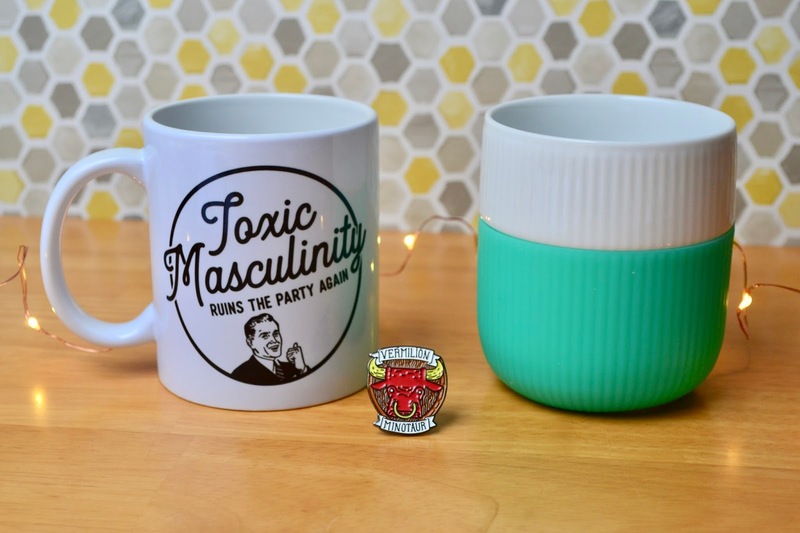 And this year I was treated to two; the My Favourite Murder podcast Toxic Masculinity Ruins the Party Again mug that I wished for. And one that my parents picked up on a trip to Copenhagen! It's a Royal Copenhagen design that has silicone to protect your hands from hot contents. Perfect for a chilly January cup of tea. On the subject of podcasts; how brilliant is the Vermilion Minotaur pin from Hello from the Magic Tavern? I've really loved pins this year and I'm glad to represent the best tavern in Foon with this! As I get older I find myself more and more excited about good skincare. So you can imagine my celebratory dance at finding the Kiehl's Midnight Recovery Concentrate in my stocking. It's a thinner oil then I'm used to and I love how quickly my skin absorbs the goodness. 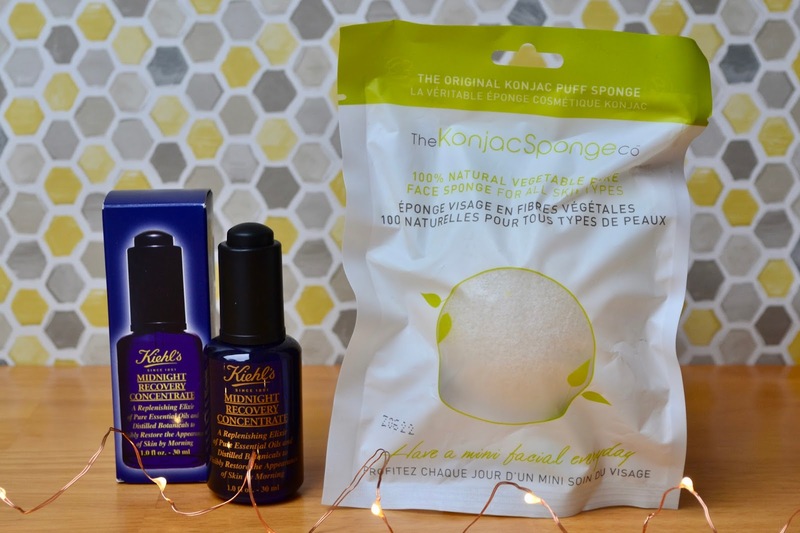 The Konjac Sponge is so weird but so cool. It's solid when it's dry but after a couple seconds under the tap, it starts to soften up until you have this handful of sponge that is ever so slightly gooey feeling without the goo. I'm into it, and I can't wait to see the effect on my skin. Since I only bought a few books in 2017 because of my self-imposed book buying ban (mini-haul here), I was really excited to get some fresh new books in my stocking. 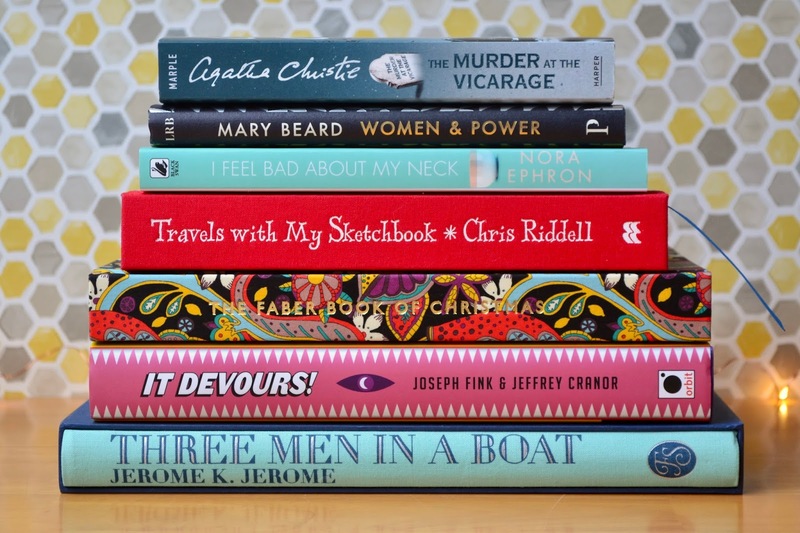 Books like the first Miss Marple novel; The Murder at the Vicarage by Agatha Christie, Women & Power by Mary Beard, I Feel Bad About My Neck by Nora Ephron, Travels with my Sketchbook by Chris Riddell, The Faber Book of Christmas, It Devours! by Joseph Fink & Jeffrey Cranor and the gorgeous Folio Society edition of Three Men in a Boat by Jerome K. Jerome! Gosh, there's nothing better than a beautiful pile of books. The entertainment continues with my new box-set of Golden Girls (in German because there's no UK full box-set). I couldn't be more excited to get to know Dorothy, Rose, Blanche and Sophia. And hello future foster cat/ Sims names! 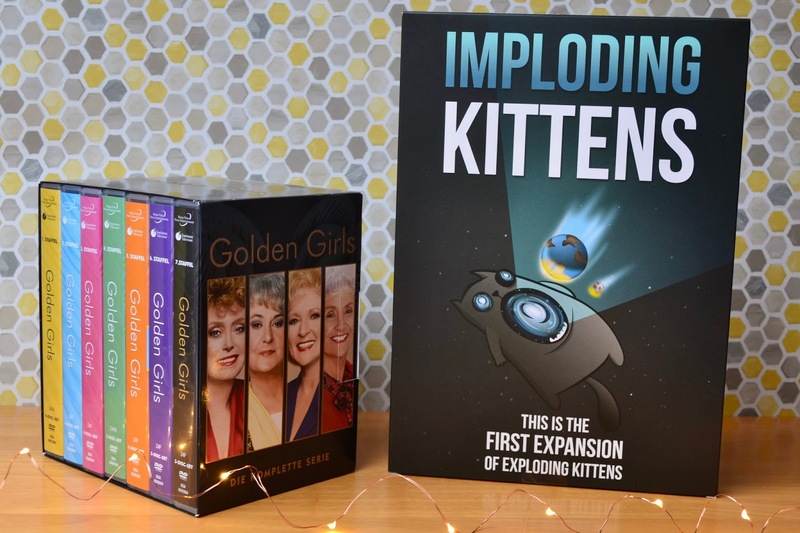 The first expansion to Exploding Kittens; Imploding Kittens is going to make the game all the more fun. If you're looking for a quick card game for a few people, you can't beat it. This expansion also comes with a human-sized cone of shame too which is just brilliant. Santa definitely had a theme this year! 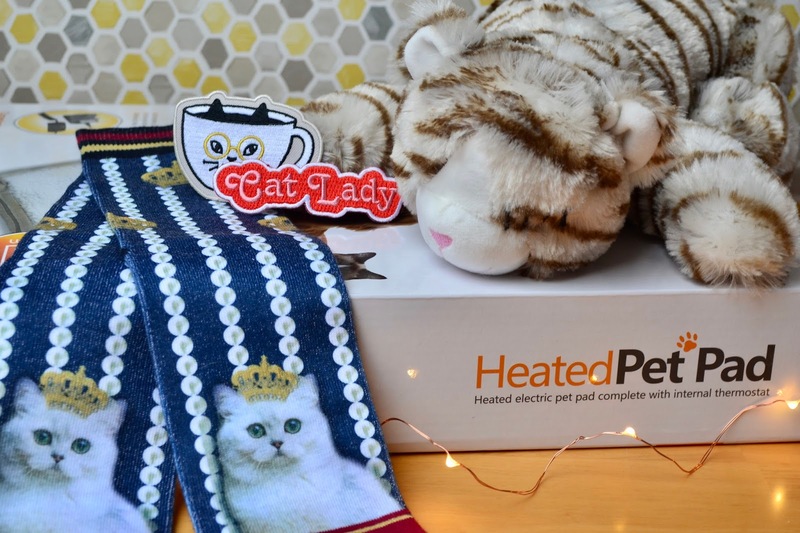 The royal cat socks are just fantastic, I'm wearing them right now and they're keeping my feet cosy as well as making me smile every time I look down. The 'Cat Lady' and cat mug patches are going to be sewn onto a boring jacket I have to snazz it up. And the big man also treated my foster cats too. The heated pet bed is currently under my desk with two very happy cats napping, and the Snuggle Kitty is going to come in handy next time I have orphan kittens! And, of course, chocolate! 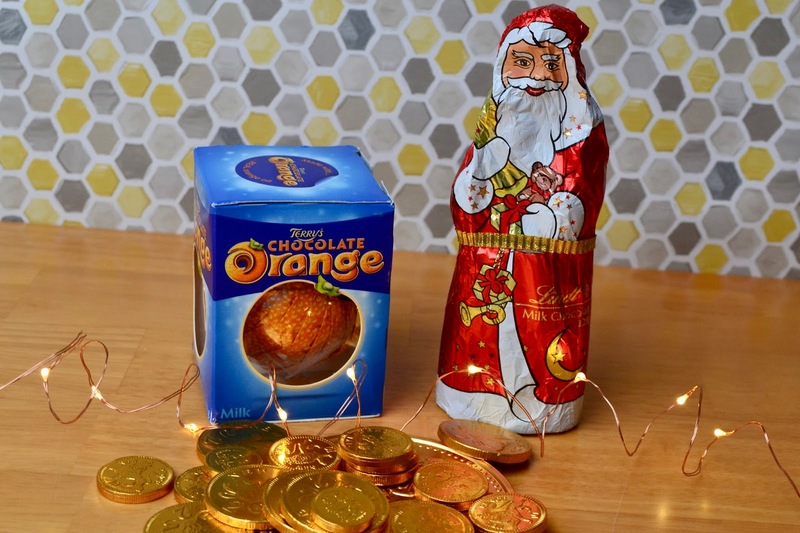 The Lindt Santa had an unfortunate squash but tasted good anyway. Probably better because I didn't have to deal with the guilt of a chocolate-y beheading. What did you get for Christmas? Link me if you wrote a post like this! My Reading Goals for 2018! 18 Books I want to Read in 2018! Books I Want to Buy and Why #14: 2018 Releases! My 5 Reading Goals for 2017: One Year On!